Both of the teams meeting for the AFC Championship on January 12, 1997 had overcome slow starts during the ’96 regular season to get there. The New England Patriots, in their fourth season under Head Coach Bill Parcells, were 3-3 after a close loss to the Redskins but then went 8-2 the rest of the way to top the AFC East at 11-5. Second-year RB Curtis Martin rushed for 1152 yards and 14 touchdowns and WR Terry Glenn set a rookie record with 90 catches. QB Drew Bledsoe (pictured at right) had his flaws but was also highly productive as he threw for 4086 yards and 27 TDs and earned selection to the Pro Bowl. The defense had started off as slowly as the early record indicated but came together during the second half of the season and allowed just one offensive touchdown in the preceding three games, which included a win over the Steelers in the Divisional round of the playoffs. Even more surprising to see vying for the AFC title were the Jacksonville Jaguars. In just their second year of existence, Head Coach Tom Coughlin’s team had overcome a 4-7 start to win five straight contests and finish the regular season at 9-7 for second place in the AFC Central and a Wild Card spot. From there they won two more games, in the Wild Card round over the Buffalo Bills and at the Divisional level against the Denver Broncos. 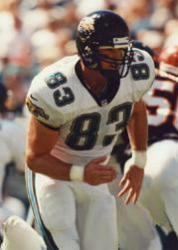 QB Mark Brunell, a mobile lefthander, led the NFL in passing yards (4367) while throwing primarily to talented wide receivers Jimmy Smith and Keenan McCardell. RB Natrone Means gained 315 yards rushing in the two postseason wins. Defensive ends Clyde Simmons and Tony Brackens and LB Kevin Hardy gave the Jaguars a potent pass rush. There were 60,190 fans in attendance on a cold late afternoon at Foxboro Stadium. Things started off badly for the Jaguars when, punting from their own 20 following the opening series of the game, Bryan Barker tried to run after fielding a high snap and the Patriots got the ball at the Jacksonville four yard line. Two plays later, Curtis Martin ran for a one-yard touchdown. The teams traded punts until the Patriots put together a drive into Jacksonville territory thanks to a 23-yard pass play from Drew Bledsoe to WR Shawn Jefferson. But a Bledsoe pass that was picked off by CB Aaron Beasley at the eight snuffed out the threat and the score remained 7-0 after a quarter of play. The first quarter ended with the Jaguars in possession and they went 62 yards in 13 plays. They converted two third downs along the way and Mike Hollis finished the series off with a 32-yard field goal. A short New England series ended with a punt by Tom Tupa, but the Patriots got a break when safety Chris Hudson fumbled when hit by LB Marty Moore and TE Mike Bartrum recovered at the Jacksonville 19. They couldn’t reach the end zone, but, following an eleven-minute delay caused by a power outage, Adam Vinatieri kicked a 29-yard field goal to make it a 10-3 score. Neither offense was able to move the ball effectively for the remainder of the half until, taking possession with 1:29 remaining, the Patriots went 68 yards in nine plays. 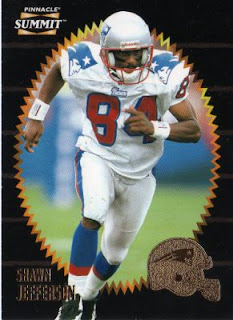 Bledsoe had three key completions, to Jefferson (pictured below) for 19 yards to start the drive, to TE Ben Coates for five yards in a fourth-and-three situation, and then again to Jefferson for a 38-yard gain to the Jacksonville three. The half ended with Vinatieri booting another field goal, from 20 yards out, and the Patriots led by 13-3 at the intermission. New England went three-and-out to start the third quarter and, following the punt, the Jaguars advanced from their 36 to the Patriots’ 31. Along the way, Mark Brunell completed a pass to Keenan McCardell for 13 yards on a third-and-ten play. But in a fourth-and-one situation, Brunell kept the ball himself and was stopped for no gain. Three plays later Jacksonville got a break when Bledsoe fumbled when hit by Kevin Hardy and the Jaguars recovered at the New England 37. Almost exclusively keeping the ball on the ground, with Natrone Means carrying five times, they drove to the ten yard line from where Hollis booted a 28-yard field goal. It was 13-6 as the Patriots took possession and advanced to the Jacksonville 43 early in the fourth quarter. Tupa’s punt pinned the Jaguars back at their 14 and they had to punt in turn. Bledsoe completed five straight passes in the ensuing series that reached the Jacksonville 23. But he was sacked for a six-yard loss and, while his resulting fumble was recovered by the Patriots, Vinatieri was unsuccessful with a field goal try from 46 yards that sailed wide to the left. Now it was Brunell with the hot passing hand and the Jaguars drove into New England territory. But on a second down play at the five yard line, a pass into the end zone was intercepted by FS Willie Clay to end the threat. Another short series by the Patriots resulted in a punt and, with 2:36 to play the Jaguars still had a chance. But on the first play from scrimmage RB James Stewart fumbled and CB Otis Smith picked up the ball and ran 47 yards for a touchdown. For all intents the Jaguars were finished, and Brunell tossed an interception on the next series (the third Jacksonville turnover in a four-minute span) to make certain of it. New England won the AFC title by a score of 20-6. The Jaguars led in total yards (289 to 234) and first downs (18 to 13), but they also turned the ball over four times to two by New England. Drew Bledsoe completed 20 of 33 passes for 178 yards with no touchdowns and one interception. Terry Glenn caught 5 passes for 33 yards while Shawn Jefferson gained 91 yards on his four receptions. Curtis Martin was held to 59 yards on 19 carries that included a TD. For the Jaguars, Mark Brunell was under heavy pressure throughout the game (most notably from DE Willie McGinest) and thus was successful on just 20 of 38 throws for 190 yards with no scores and two interceptions. TE Pete Mitchell (pictured at right) caught 7 of those passes for 63 yards and Keenan McCardell contributed 62 yards on 6 pass receptions. Natrone Means gained just 43 yards on 19 rushing attempts while James Stewart had 40 yards on 7 carries, although also a key fumble. The Patriots went on to lose to the Green Bay Packers in the Super Bowl – the Packers had beaten the other 1995 expansion team, the Carolina Panthers, in the NFC title game to eliminate the possibility of either of the new clubs vying for top honors in the NFL. It was the last game for Bill Parcells as the team’s head coach. Citing differences with owner Robert Kraft, he left the club and resurfaced with the Jets (with the help of a deal brokered by Commissioner Paul Tagliabue to satisfy Kraft). Under successor Pete Carroll, New England went 10-6 to again top the AFC East but lost in the Divisional round of the playoffs. The Jaguars, meanwhile, proved that the strong showing in ’96 was no fluke as they came back strong at 11-5, again placing second in the AFC Central and gaining a Wild Card slot. They lost convincingly to Denver in the first round of the postseason.